Henry Ford saw the value of protecting his equipment and protecting his driver when he invented the first automotive firewall. It was born of necessity. There was no way he could sell cars if the motor should catch fire and the driver or passenger was burned. Ford also envisioned the ability to drive the car without smoke, fumes and gases overwhelming the driver. When the first “firewall” was invented, it was simple, it was clean and it worked. It worked so well that other manufacturers of cars, trucks, and buses adopted the idea and the “automotive firewall” became a household name. This was almost 50 years before there were structural building or computer firewalls! What is the metal plate called that separates the driver from the engine compartment? All 100 mechanics called the metal plate a “firewall.” A random survey of 100 middle aged men were asked the same question. Ninety five percent called it a firewall and 5 % did not know the name but mentioned that it was supposed to stop a fire. When the participants in the survey were asked if they were convinced the automotive firewall would protect them in case of an engine fire in a modern vehicle, the response was as follows: 100% of the mechanics (some took a pause before answering) thought that it might protect them for a few seconds in a raging engine fire but all agreed that any engine fire will be nasty. The wires cables and hoses will be the first spots to give way to fire. As they burn, they will pump toxic gas and smoke in the driver’s compartment through openings created when the plastic, rubber or tar like substance becomes fully involved and melt. The mechanics also noted openings around the steering shaft and shifter openings will fail to stop an engine fire and contain it to the engine compartment as Henry Ford intended. Today’s cars are inundated with penetrations made by speaker wires, telemetry equipment and video cables. All fuel for a fire. But wait there is MORE. When the 100 middle aged men surveyed were asked if they were convinced the automotive firewall would protect them in case of an engine fire in a modern vehicle, the response was as follows: 47% thought it would but 53 men knew it would offer very little protection. 100 middle aged housewives were asked if their cars, trucks or mini-vans had inherent features in the firewalls to protect them in the event of an engine fire. 100% said yes. From the research we have conducted, I offer you the information that I have acquired from the automotive industry. There are no standards. No one regulates the automotive firewall. There are no minimum standards for “firestopping” to protect the occupants in an engine fire. There are no industry standard practices that employ sound technology for firestopping the automotive firewall. In fact, the items we found in the average automobile to seal penetrations act as accelerants when ignited. Restoration projects were also using products that will not stop the fire but sold as fire “retardant”. Would you like a firewall in your office building that was fire retardant or one that was fire proofed and firestopped? There is no debate. There is no one that I could find to talk to about the situation. I called the Automotive Engineers in Washington. They regulate everything in the automotive industry, except firewalls. In fact, once I got to a young engineer who informed me the automotive industry does not recognize a vehicle as having any firewalls. He said they were “bulkheads.” When asked to elaborate he referred me to legal counsel. I won’t debate with a Washington lawyer the merits of a firewall. Where there is knowledge, there is progress. The racing industry is the test and proving ground of the modern car and truck industry. Every racer I have spoken to respects the life safety aspects of the firewall and many will take steps to improve their chances of getting out of a burning race car without being burned. Restoration mechanics and drivers of restored vintage cars and trucks, once educated, will take steps to protect their investment where the firewall is concerned. Many of the people involved with racing know the dangers of an engine fire. Not a single competition driver hesitated to know more about fire safety if they had ever been involved in a fire. What to do now? That is the question. 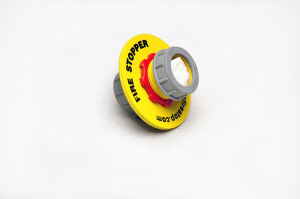 Our small firestop company has developed unique fire stop systems for commercial and industrial buildings. These systems allow wires and cables to penetrate a fire rated barrier. It is tested to standards at Underwriters Laboratories and if it passes the test, we get a listing. My son Matthew races at the local dirt track and I began going to the track with him about 2 years ago. Soon I was hooked. I joined the IMCA and now we both race the hobby stock class at Deep South Speedway in Loxley, Alabama. It was at that track that I first discovered the automotive firewall was no firewall at all. The hobby cars that we bought had holes big enough to place your fist in right in the middle of the firewall. It did not take long for us to modify and scale down the mechanical systems we had developed for buildings to seal the race cars firewall. We put all the wires, cables and hoses in sleeve systems. We sealed all the cracks and seams in the firewall with fire rated expanding foam. We sealed openings for things that have movement, like the throttle rod, with a special fire rated sponge that absorbed the flame from an engine fire. All that we did in the name of “self preservation” at the time. We are able to race now with no worries that we might get burned in an engine fire. Then I began the aforementioned research. Now we are in the Automotive Firestopping Business. The new division of Unique Fire Stop is awash in ideas for the life safety of the race driver. Our products are developed at the local track and tested to the limits of our imagination. There are now two types of sleeve systems available. 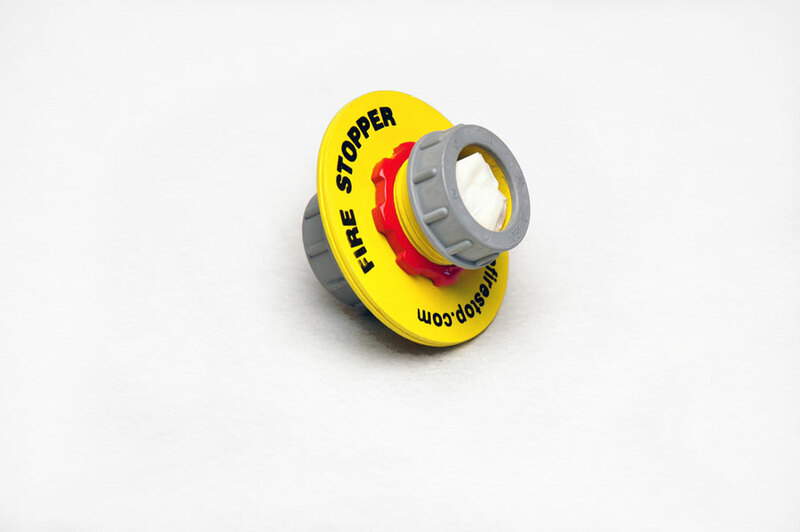 The Standard FireStopper is made of steel and is for restorations and hot rods. The HD FireStopper is a threaded aluminum light weight sleeve system that is designed for extreme competition, temperature and environments. Both systems are available in 1 – ¾ and ½ inch diameters and include intumescent firestop putty to seal the system. The expanding firestop foam is available now in a form that will not gas you if there is a fire. Many mechanics will seal cracks and seams with silicone or Great Stuff insulation from the local building supply. STOP IT! When exposed to flame, Great Stuff will catch fire and produce toxic gas. Silicone is even worse! Our last mission was to seal openings where shafts and rods require movement through the firewall. Mission accomplished with our automotive “sponge”. The sponge actually soaks up the fire and can be installed to allow for the movement of a shaft or rod without exposure to an engine fire. All 3 systems are now assembled in the form of a Kit. One Kit should firestop a race car front and back and are available as a standard or Heavy Duty Kit. We have priced the total system at less than what a good pair of gloves cost. The commercial side of the firestop business has taught us well that only properly trained people will be capable of performing the task of automotive firestopping. We now offer the first and only Factory Certification training for mechanics and engineers. It is web based and involves watching a training video and taking a test. Students will receive a Certificate, be listed on our map of certified installers with links to their website and email. Certified Installers will be able to purchase direct from the factory at substantial discounts. There is no cost for this training. We are accepted for use in NASCAR, IMCA and SCCA organizations. This new concept can be seen at www.uniquefirestop.com and is currently available through SPEEDWAY Motors.